This whole adventure started with a search for the perfect sausage to use in a recipe for pork with clams, which led to a little ceramic pig, and ended up with a truly excellent party. This cute little piece of specialty cookware, which looks like footwear for some impossible outer-space monster, is in fact designed for brazing sausages over flaming, hi-octane Portuguese liquor. As we learned the purpose and the method for using this device, we became completely distracted from our original mission and found ourselves planning a sausage-roast. 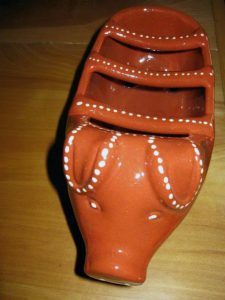 First, we had to obtain the little pig dishes from Portugal – that was easy and took only a few weeks. As soon as the dishes arrived we set about making home-smoked sausages and invited some guests to come over and roast them with us – RSVPs were instantaneous and none declined the invitation. The sausages that are required – linguiça or chourico – are not easily found freshly made in the grocery store; the smoked sausages you do find are often laminated in plastic, oozing a creepy slime when opened, delivering a texture of rubber bands with what seem like bits of potato thrown in – the bits are the fat but for some reason completely unlike the fat in a homemade sausage. If these laminated sausages are the only smoked sausage you have ever known, then you must find some real, home-smoked sausages, or make your own. 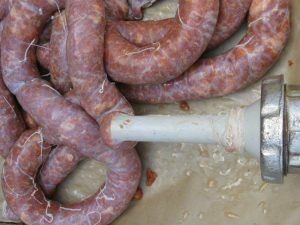 With pork shoulder and a few other ingredients, a good old-fashioned meat grinder, and some type of smoker, you can have a plate of these sausages to set fire to with your friends. Vermillion Linguica looks stunning on blue Heathware plates! People have been making sausages and brazing them since the dawn of time. You can follow the accurate but brief instructions provided in the Ancient Roman De Re Coquinaria of Apicius (published by Walter M. Hill, 1936). Here, the proper color of smoked sausages is described perfectly – vermillion – a nearly forgotten word and color that deserves to make a comeback. Vermillion is the color of notoriously poisonous cinnabar, which is a substance with an interesting history of its own. Take a look at cinnabar on dolomite and you will see that the Romans have described the color of smoked sausage precisely in the recipe for Cirellos isiciatos, Round Sausage. Start out a day or two before you want to eat the sausage, to complete the marinating phase. In an agrarian economy, the seasonal time for making sausage was in the fall when a hog was slaughtered; everyone hurrying to preserve the large quantities of meat for the long winter. Smoked sausage was a hedge against starvation. In the modern, refrigerated world, sausage can be made year-round and is a reason for a party! When making sausage at home, be careful to use safe food-handling techniques, clean equipment and clean hands at all times. Note that the Latin root of the word “botulism” is the word for sausage – botulus. That is not a coincidence. Study the conditions under which food pathogens can replicate and then avoid those conditions. To obtain several pounds of ground pork for sausage, purchase a “pork shoulder” weighing over 9 pounds. Very carefully remove the skin from the pork shoulder (not used in the sausage), slice the meat from the bone with a boning knife, and cut the meat in to large chunks. The foundation of the pork shoulder is a complex articulated joint, so extreme care must be exercised when wielding the boning knife. How do orthopedic surgeons ever actually manage a functioning joint replacement? Save the bone to cook with dried beans. After cutting the meat from the bone, modern cooks might be tempted to eliminate and discard all the fat, but the fat and connective tissue are the keys to great flavor. Remove the fat and you surely will create disappointing, dry sausage like the last bit of an overcooked turkey breast that’s been loitering on the platter way too long after the Thanksgiving dinner. To make a good sausage, fat is required. Weigh the boned meat and season it with proportional amounts of the paprika, fresh garlic, salt, Portuguese rosé wine, sugar and pepper called for in the recipe. We had 6 pounds of meat, so we increased the seasonings proportionally. Stir together the spices and wine, then mix in the chunks of meat – and commune with the ancestors who were marinating meat for millennia. Judging from 18th century engravings, the ancestors seemed to have had cats, chickens and dogs running around under the table during the sausage-making process, not the ideal situation for food preparation. Perhaps it is wise to banish the cats, dogs and chickens to the yard, before proceeding. Unlike ancient peoples, we refrigerate the marinating meat and keep it cold during the remainder of the 1-2 day process. 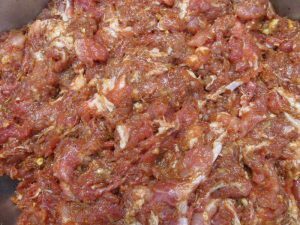 After marinating the meat under refrigeration, grind or chop it in to small pieces. There are many different types of grinding devices available. Whichever method you use, your goal is to produce small bits but not a paste – one of the principle differences between a sausage and a lowly hot dog is the consistency. We use a Magimix food processor for chopping meat, working with a small amount of the meat at a time (maybe a half pound) and using the “pulse” feature – intermittent chopping – as noted in the directions that came with the machine. This works very well. Many older-model food processors would grind the meat too finely. If you have an old fashioned meat grinder, use the blade and the coarsest disk. Again, a great opportunity for living the life of the ancestors presents itself. 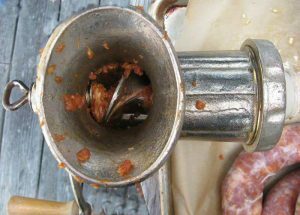 The sinews can clog up the disk, requiring frequent cleaning, We use our old-fashioned grinder mostly for stuffing the sausage casings. The grinder clamps to the table and can be easily removed, cleaned and stored. The other meat grinder that makes no sense is the kind that suctions to a smooth surface. This seems impractical because of the amount of force required to grind meat, and because suction devices usually cease to function correctly despite being adhered to a glass-smooth surface. How many times has the suctioned soap dish fallen in the shower, or the GPS device toppled in to the automobile? One way or another, chop the marinated meat in to small bits, then chill it while you prepare the casings. The next step will be preparation of the hog casings. For unknown reasons, hog casings, if you are lucky enough to find any, are usually on the top right hand corner of the supermarket shelf that houses ham and pork products. In a plastic tub or sometimes a plastic bag, the “casings,” which are really cleaned intestines, are packed in salt. Years ago, hog casings had a distinctive funky odor but recently purchased hog casings have had no odor whatsoever. We were surprised to find that packages of hog casings come from all over the world – it is interesting to read the label on the package. 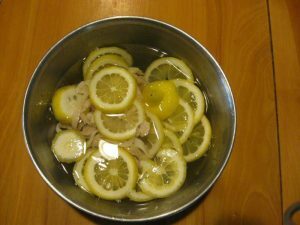 Soak the hog casings (3 feet for every pound of meat) in warm water with a sliced lemon for 30 minutes to soften and desalinate the casings, then run water through them to ensure they are clean (discard the lemon slices). As the water runs through, marvel at the structure and strength of this wonderful material. One of the many remarkable things about sausage casings, or intestines in general, is how terrifically strong they are. They have been used for millennia as string and thread, and as strings for musical instruments. The 120 foot intestine of a cow is formed in to harp strings and then, under enormous tension the strings are plucked to produce musical notes; Gut is used by surgeons to sew up wounds, and by tennis players to string their rackets so they can slam balls in to the ground at upwards of 70 mph. It is much easier and more fun to stuff sausage with two people working than all by yourself. Use a meat grinder to stuff the sausages. You need 3 feet of hog casing per pound of sausage, allowing for a little extra at each end of the sausage. Remove the blade and grinder disk and attach a sausage stuffing funnel. Slide a length of hog casing on to the funnel. Now put the seasoned sausage meat through the grinder, turning the handle slowly and steadily with one hand and easing the meat in to the casings with your other hand. The meat goes in to the hopper and comes out in to the casing. When the casing is nearly full (with 6 inches of empty casing remaining) remove the sausage from the funnel and start on the next sausage. Don’t complicate your life by trying to tie knots in this sausage. Just set the filled sausages aside to chill in the refrigerator until it is time to smoke them. The sausage stuffing funnel is efficient! Follow the instructions on a smoker, and use apple wood for the smoke. Check the internal temperature of the smoker to insure that it is hot enough to do the job safely. We used a Primo ceramic grill to smoke the sausage, paying careful and regular attention to adjusting the vents, and maintaining a higher temperature than recommended in the original recipe – just below 200° F. We chose to smoke the sausage until the internal temperature of the sausage was 170° F, which took approximately 3 hours. We recommend that any home cook do their own research to determine a safe process. The FDA provides some guidance on this. When completely smoked, the color of the sausages will be a deep red vermillion. 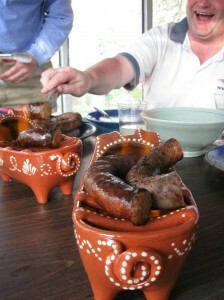 The sausages are not preserved by this smoking – they are merely cooked through. From this point on, they should be preserved like any other meat – in cold storage for a few days or in the freezer for a longer period of time. Do the homemade sausages look dry to you? 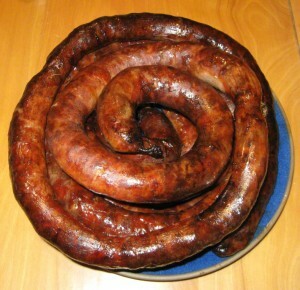 That is the miraculous thing about real smoked sausage – although the exterior of the sausage is dry, the interior is just right – juicy and delicious. As a reward for your labor, taste a few slices before you put them away to chill. Place the assador on a heat-proof surface, preferably in a location that is not windy. Pour a pool of aguardente in to the assador. Using a long match, set the aguardente ablaze without setting anything else on fire. Cut off pieces of sausage to fit the assador and place them on the racks over the flames. As the sausage cooks, some of the fat melts in to the cooking device and fuels the alcohol-based fire, and as this happens the flame goes from blue to yellow and the sound of sizzling fills the air. The blue flame from burning alcohol is cooler than the ensuing yellow flame from the burning fat. The cooking process speeds up as the flame turns yellow and gets hotter. Turn the sausages carefully with tongs, and make sure to cook them until they are blackened. Remove them from the flames too soon and the interior will be dry and hard. Keep cooking the smoked sausages until they are crisped up on the outside, and the fat is melting on the inside. One of our assadors acquired a small crack during the roasting party, so again, take precautions and take good care. We poured a rosé with the linguiça, to match the flavoring component of the sausage. A dry, hard cider and beer were also fine accompaniments, along with a Colombian bean dish, a selection of cheeses including the outstanding Winnimere cheese from Jasper Hill Farm in Vermont, and a fine green salad supplied by some excellent cooks among the company at the table. We ate, as the Hawaiians say, until we were tired. Notes for further study: There are other versions of this type of sausage brazing grill – This one uses skewers, for example. This one shows a much deeper, sturdier cooker which we are interested in acquiring, in case anyone knows where to get one. Here is a video recipe that shows grilled linguiça as a garnish for a small soup. Many years ago, on a train traveling slowly through the French countryside – I don’t remember exactly where and I refuse to invent a location for the sake of a story – I met a man whose job it was to sell cheese mold. This friendly man was sitting in the same compartment with me. I was naturally apprehensive when he started to speak. Sometimes men traveling on trains want to share stories and sometimes they want to show young women other things whether the women are interested or not, but that is another story. The suited gentleman had a tidy briefcase which he offered to open so that I could see his wares. It was a great relief to find that he was a genuine gentleman, and that what he wanted to display was an assortment of tiny envelopes containing samples of unique cheese molds that were required in the production of famous French cheeses such as Camembert and Brie. Perhaps interpreting my relief at his desire to talk about cheese as an ardent interest in learning about his profession, he explained the whole process by which these molds would be sprayed on the cheeses during the manufacturing process. The uniform, paint-white rind of fresh Brie, with its mushroomy aroma, had mystified me until that moment when I learned that the rind was a fungus just like the kind of thing that produces mushrooms and that this fungus was sprayed on to the cheeses; an aerosol mushroom. I had wrongly pictured the right molds, living in the area, just meandering in on a fresh lavender-scented breeze from the French countryside and settled conveniently on each cheese, creating a uniform coating. In fact, a mushroom is the fruiting body of an underground fungus, poking up through the forest floor. The Brie cheese rind is seeded with the spores of a particular fungus that does not make those pop-up fruiting bodies. So, fine cheese and mushrooms are related, which makes sense when you think about it, and I got the first inkling of this knowledge on a rumbling train. It was also news to me at the time that cheeses were mass-produced rather than made individually the way we had tried to do at home. Unlike our lonesome artisanal cheeses that cured with the native spores traveling through the air at our house, there were whole rooms full of camembert, just sitting around waiting to be sprayed with precisely engineered mold. I pictured in my mind whole rooms full of cheeses just sitting there, waiting. Our few attempts at making homemade cheese had been laborious. One particular cheese required a few gallons of whole, unpasteurized milk and some rennet, a funky smelling material derived from the stomach of a cow. You could obtain rennet at almost any grocery store by purchasing a package of “junket” mix – this is actually rennet that can be added to milk to make a sort of custardy dessert that has now fallen out of favor – or you could purchase rennet tablets specifically intended for cheesemaking, in a small cylindrical vial. [i] We used the rennet tablets and our homemade cheese had a pleasant flavor. We coated the cheese with wax that we tinted turquoise with candle-dye, to make our cheese stand out from those endearing goudas encased in the bright red wax that children love to play with at the table, annoying the grownups. Our wax was too hard and did not have the elasticity of the red cheese wax, so there were occasional holes and leaks in our coating which we patched horribly with little globs of additional wax. As amateurs we had lots of enthusiasm, but we didn’t have all the skills and equipment of the professionals. There are so many diverse careers out there in the world. Here was a man who traveled around on trains with a suitcase full of mold. He provided a vital service to one of France’s major food industries, and he obviously enjoyed the work, the travel and the conversations along the way. He was not a Willy Loman character[ii] suffering from depression and despair, ruining his home life with his philandering ways. He was a proud, friendly gentleman who happily went about selling cheese mold to the heroes of French cuisine. I did not get his name, and by now he must be a very old man, but if I could I would thank him and ask him so many more questions. I encountered another great member of the world of cheese professionals on Arthur Avenue in the Bronx, New York, in the 1980s. My memory is of a small shop where a lumberjack-sized man with large handlebar mustaches created mozzarella cheese with his bare hands. He made it look easy, as he kneaded the white curds in nearly boiling water until the cheese stretched like taffy. The process of creating hot ropes of cheese from milk turned out to be much trickier at home, especially since my hands were not used to being immersed in very hot water for extended periods. My hands turned red as they cooked, and I did not have the strength of this giant professional. I have recently learned that it is possible to make homemade mozzarella using a microwave oven. People swear by this method and some claim to make cheese every week, almost ritually. This development could revolutionize many home kitchens, whether or not the cook adopts an obsessive-compulsive cheese-making habit. Following are links to a pictorial instruction on how this microwave mozzarella is made. The thing that is missing though is the slow, steady stirring; the brilliant efficiency of the strainer sinking in to the whey to separate the curds; the loving kindness of the great artisanal food artist at work. [i] Junket mix is still available today, and there are recipes for using it to make cheese here. [ii] Miller, Arthur. Death of a Salesman. Gfzing.com is once again bringing you the DIY recipe you have been looking for – how to make your own seasoned rice vinegar – the kind of vinegar that is used to make sushi. The proportions for making Japanese seasoned rice vinegar are as follows – as described in the interesting Japanese cookbook Japanese Cooking for the American Table (by Karen Green, 1986, ISBN 0-87477-376-8). That’s it! In any recipe that calls for seasoned rice vinegar you can use this mixture. If you include your own homemade vinegar, even better! You can be sure that your seasoned rice vinegar is gluten free! Homemade vinegar is easy to make – it kind of makes itself under the right conditions – and we have been making our own for 25 years. The vinegar you buy in the grocery store (white, cider, wine) is sharp tasting and thin in flavor compared to the rich complexity of a homemade vinegar. Make your own vinegar and you will become a fan! Also, with your own homemade vinegar there is no need to read labels looking for gluten-containing items. The test of a delicious vinegar is this: sip up a teaspoon of the vinegar and you should want more! You will not want to waste this homemade vinegar making those baking soda and vinegar volcanoes that are so popular in elementary and middle school classes. 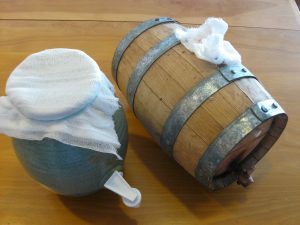 If you really get in to making homemade vinegar, you may want to invest in a handy vinegar crock with a spigot, or an oak vinegar barrel. Bear in mind that it is not safe to use homemade vinegar in home canning or pickling, unless you are a talented chemist who can accurately test the acidity of your finished product. For pickling, you need 5% acidity. Choose what kind of vinegar you are making: red, white, cider. Dilute leftover wine or hard cider with unchlorinated water, about 2 parts of wine to one part of water. Put about a quart of diluted wine in to a cleaned large mouth jar or bowl, or vinegar crock. We use C-brite to clean the container. Add the starter culture. 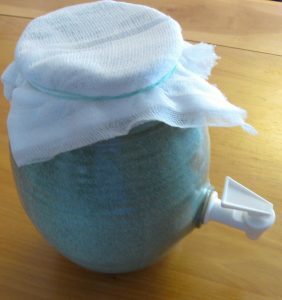 Stir with a clean spoon; cover the container with cheesecloth secured with a rubber band (keeps out fruit flies while allowing air to enter). Store the crock at the back of the counter in your kitchen, where the vinegar will remain largely in the dark and at 68-96 degrees. In about 4 weeks the first vinegar should be ready to use in salad dressings and sauces. Pour off some of the vinegar, taste it and dilute it with additional water if it tastes too strong, then bottle it in sterilized bottles and cork the bottles. Now add more diluted wine to your crock – this is called “feeding” your vinegar and let it go. Each time you get ready to bottle some vinegar, taste the finished product to see if it is ready for bottling, and add water if the flavor is too strong. 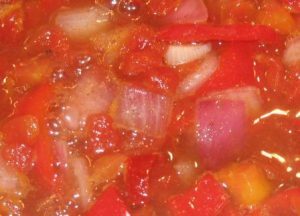 Since this is a trial-and-error, imprecise method for achieving the final product, you will not know the final Ph of the homemade vinegar and cannot use this vinegar to make pickles or preserves that are not refrigerated. 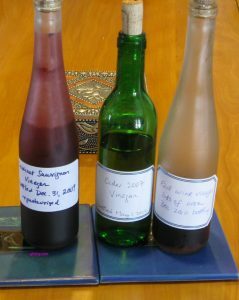 To make vinegar, you add a starter culture of acetic acid bacteria to an alcohol base (like wine or hard cider). For the starter culture, you can use some vinegar from a friend’s vinegar crock, or you can buy a culture. For gluten free vinegar, do not use malt vinegar culture. Vinegar mother is a thick cellulose material created by the vinegar bacteria. People who have never handled vinegar mother call it “slimy” but that is not a good description. The material is strong, thick and fibrous, stretchy, slippery and somewhat leathery – like the covering on a papaya seed, or a sort of fibrous jelly. It can break cleanly in to clumps when you pull on it. The mother accumulates in your crock or barrel, and eventually some of it needs to be removed to make room for more wine. The mother is not necessary to the formation of new vinegar – what you need is the bacteria. So, if you have a friend who makes good vinegar and does not pasteurize it, ask for a sample of their vinegar and you are ready to go. A word about vinegar barrels – the oak vinegar barrel adds a strong oak flavor to a red wine vinegar, and we use one for this purpose. However, the home vinegar maker should be forewarned about a couple of things. 1) The vinegar barrel should be soaked before using, to prevent leaking. 2) Unless the barrel has a large opening at one end, removing old vinegar mother from your vinegar barrel requires two people, because most of these barrels only have small holes through which to remove the mother. One person holds the barrel so that a hole is facing downwards (the largest hole is the air hole at the top) and the other person uses a surgical hemostat clamp to grab bits of the mother and pull them through the hole. This is a messy process. We bottle the vinegar without pasteurizing it. Do not use homemade vinegar for making pickles. Vinegar used in pickling must be of a certain Ph, or you can have spoilage and dangerous bacteria can grow in the pickles. Once again, Gfzing.com cracked the binding on a bunch of cookbooks to find a tasty gluten free poultry seasoning for the Thanksgiving turkey stuffing. We looked through the usual suspects, those older books that included formulas for standard seasonings and came up empty! Then, on an old bottle marked “poultry seasoning,” we found a typed list, taped to the bottle. The ingredients are listed below. 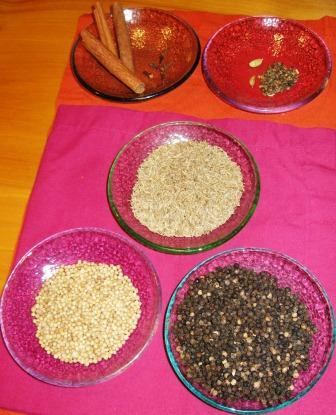 The herbs and spices for poultry seasoning are similar in all formulations, it is just the proportions that change. The sage and thyme should predominate. 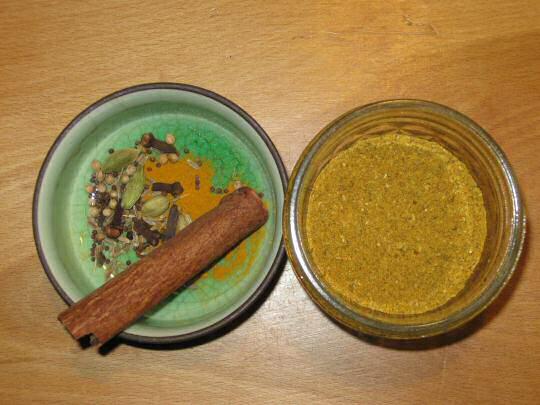 Some poultry seasoning recipes include nutmeg, and some include celery seed. 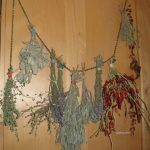 We dried the herbs from our garden, at the end of the fall, by hanging them upside down in the kitchen to dry. If you don’t have home-dried herbs, you can use bottled herbs. These ingredients are listed in “parts” – you can substitute teaspoon or Tablespoon for “part” in the recipe, depending on how much poultry seasoning you want to make. You can assemble all of these in a large, stone mortar and pestle and grind them quickly to a fluffy powder. It is the sage that adds the fluffiness to this preparation. 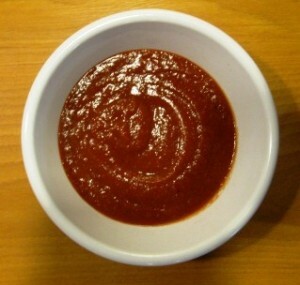 Making your own custom ketchup is easy-peezy! At gfzing.com, we made a careful study of the available recipes for homemade ketchup, and concluded that the ingredients in most tomato ketchups are pretty much identical. The spicy ketchup variant here is gluten free and can be served with fries, meatloaf, Shepherd’s Pie, hamburgers, hash browns, corned beef hash or any other dish that requires ketchup. We tasted the typical store-bought ketchup which is very smooth, mostly sweet, with heavy tomato and celery seed notes – sort of like sweetened and thickened V8 juice! We also read Malcolm Gladwell’s interesting discussion of why there are so many mustards and only one ketchup. Afterward reading that, we thought that we would not like a ketchup substitute, but we were wrong. This ketchup is better than bottled ketchup! We started with a Saveur recipe for homemade ketchup. We replaced half the tomatoes with sweet red peppers, added sweet potato and dates for sweetening and thickening, and switched out their brown sugar with some agave syrup and gluten free fruit jam, to reduce the amount of refined sugar in the recipe. We changed the amount of spices, and upped the hot peppers. The final ketchup has some chutney-like flavors. It has more flavor than bottled ketchup, and far less refined sugar. It provides dynamic tension for your meatloaf! First, put all the ingredients in a saucepan and cook over medium heat for about 45 minutes, stirring occasionally, until reduced by half. The material will start to stick to the bottom of the pan. Be careful that it does not burn. When cooked, cool and then puree the mixture thoroughly in a blender or food processor. Taste, and adjust the salt, sweet, and sour flavors as necessary. That’s it! Serve warm or cold. Store, covered, in the refrigerator. This is not a “preserve” since it has a low sugar content and low salt content. It cannot be kept indefinitely. Make sure all your ingredients, including spices, are gluten free.